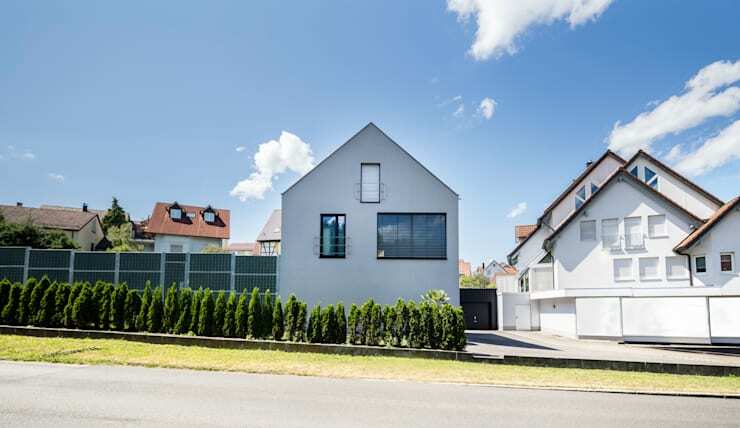 Today, we are going to visit Germany where design professionals Schiller Architecture BDA took an old-fashioned and boring home and turned it into a very modern and stylish space that will certainly turn heads. As we explore this home, we will see how clean lines and a savvy design breathe new life into this architectural structure. This space is a wonderful example of how a family home can still pull off a very contemporary and stylish design, without compromising on comfort and coziness. We also hope that today you will pick up some tips and tricks for your own home, learning just how you can achieve a modern and savvy home yourself! From this angle, we can see just how outdated the home was before the designers intervened. While it is large in size, it features old yellow and brown tones that are not very attractive or appealing. The home hadn't received a refreshing look and feel in quite some time, even though it holds all sorts of potential. It spreads over three-storeys with an interior that spills out onto a gorgeous garden. You won't believe the transformation! This looks like a whole new home! It features clean and modern lines, with sharp white tones. This is a home that packs a punch! We can also see how the crisp, white facade works in harmony with the lush green plants and trees. 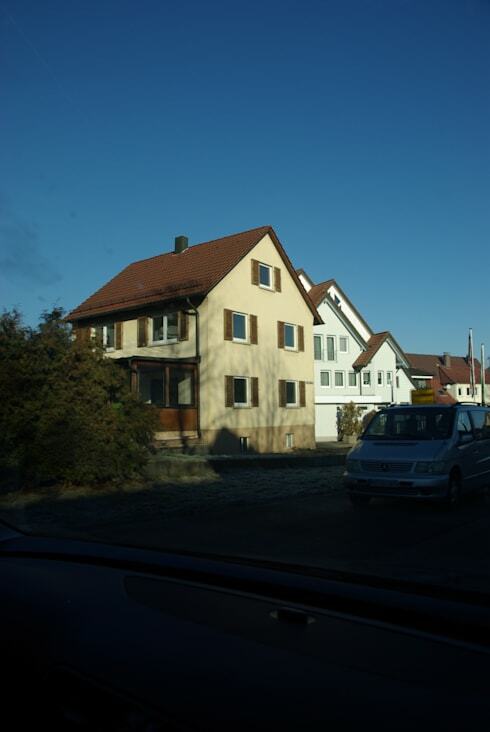 On the right-hand side of the house, we can also see how a driveway leads up to a neat little garage. This is a must for any Canadian home, keeping cars, bicycles and other items neatly stored away! The result is a very tidily packaged exterior design. 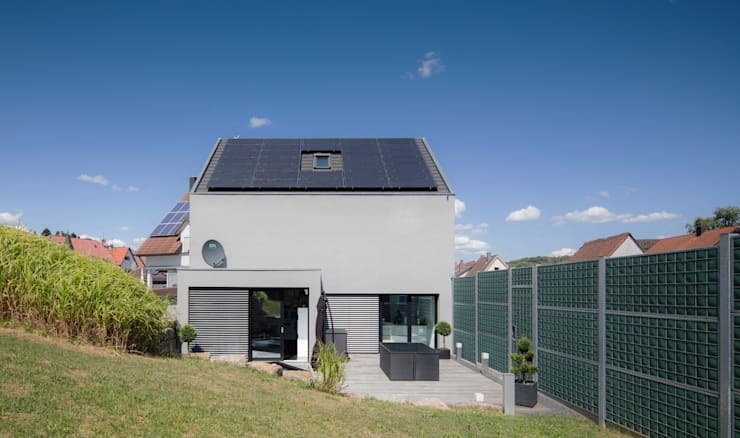 From this side of the home, we can see how the modern and contemporary design has resulted in a far more sustainable home complete with solar panels on the ceiling. Modern design is all about going green . In today's world, we can't afford to have a high carbon footprint. We need to be responsible about the energy that we use and a sustainable design is the way to do it. Solar panels, for example, allow the sunshine to be converted into energy for heating and lighting in the house. We can also see how the clean lines make for a very appealing design, while the home opens up onto a gorgeous little terrace where the family can enjoy the garden, fresh air and sunlight. If we head inside the home, we come across a very simple and sophisticated staircase. When it comes to modern design, we want to try and keep things as functional as possible, getting away from clutter and chaos. 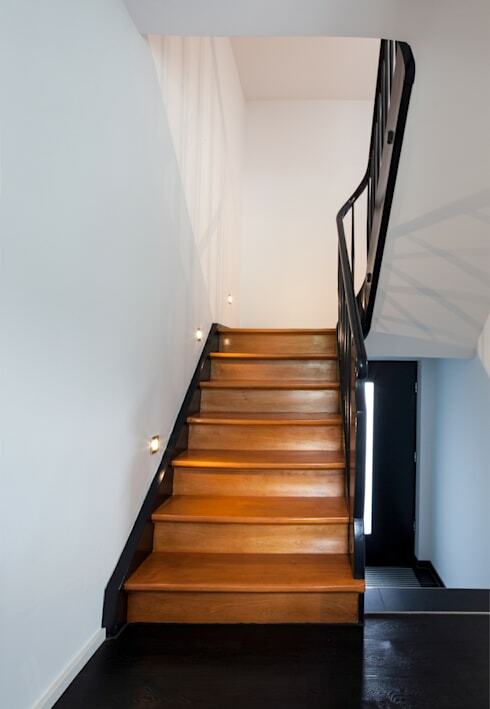 A staircase is a wonderful example of how function and design collide. 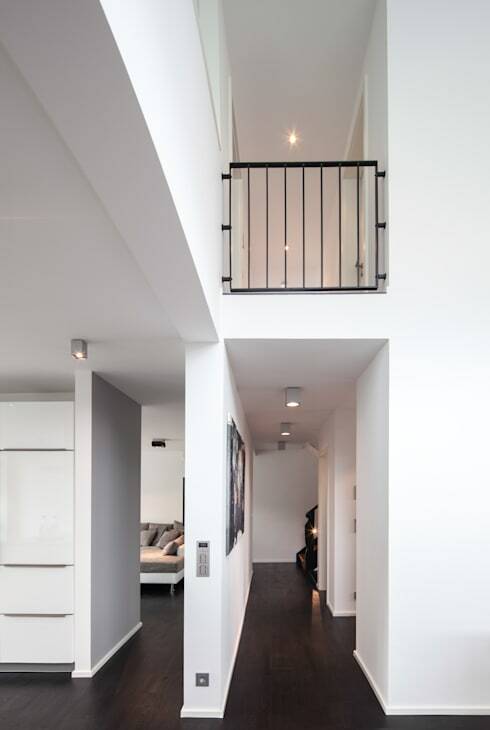 Wood has been used to add a warm and homely touch to the interior design, while the black railings give it an edgy touch. Have a look at these other wooden staircases that wow for inspiration! The inside of the home takes on the same crisp white look and feel that we saw throughout the exterior space. White is a wonderful colour because it reflects the sunlight that flows into the home, making for a very light and appealing interior. During the evening, soft dimming lights in the ceiling create a wonderful and homely ambiance. Candles, lanterns or lamps can also achieve the same effect. We can also see here how the designers have gone for an open plan design, making the home seem that much more spacious and expansive. The rooms flow into one another, while still remaining slightly separated depending on their function. We end off our tour in the fabulous kitchen, which features the same white tones. The black finishes create a slightly more dramatic look, working in harmony with the sunlight that floats in through the large glass windows and doors. The large kitchen island in the middle of the room is the star of the show. 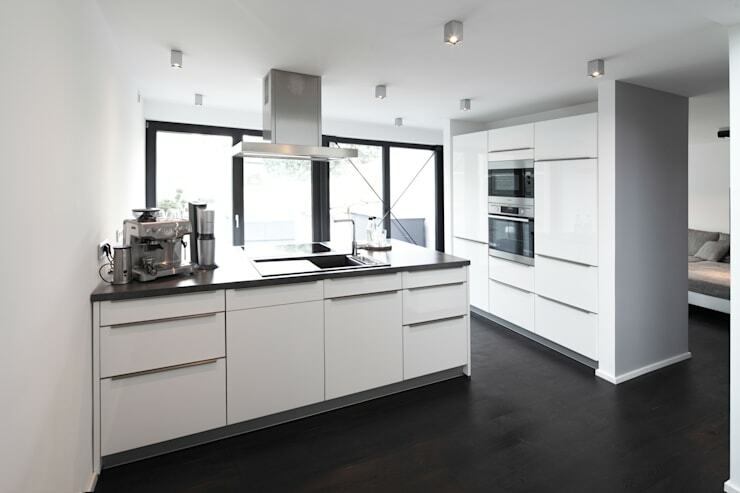 It creates extra storage space for the kitchen as well as an extra surface for cooking or preparing food. Storage is key in a family home, keeping the space looking neat and tidy. The kitchen is one of the most important areas to get this right as it's the heart and soul of the house. Have a look at these 8 clever ways to improve storage in your kitchen for inspiration for your own home! What do you think of this transformation?